A holiday in Brazil with children is going to tick all the boxes in hugely surprising and entertaining ways. A steady stream of wildlife experiences, exciting activities, fabulous food and incredibly friendly locals will leave the entire family wanting more – and the good thing is there is enough of Brazil to go round several family holidays. From the fun-loving city of Rio to the endless natural delights of the Emerald Coast around Paraty. To sum it up, if you are visiting Brazil with kids, there will be nature, wildlife, water – lots of it – sun and fun. Here are our ‘High Fives’ (our five favourite child friendly activities) for each of the key locations. No trip to Rio is complete without hopping on the cog train chugging up the side of Corcovado Mountain. Here, take the ultimate selfie beneath the welcoming arms of Christ the Redeemer statue. The next port of call is Sugarloaf Mountain. Why take the cable car when you can hike the Morro da Urca Trail through gorgeous forest with hardly a soul in sight, surrounded by marmosets and squawking birds. At the top you can enjoy a traditional caipirinha cocktail looking out over Guanabara Bay and (at night) an illuminated Cristo Redentor statue. High above the clouds, with the faint sounds of samba from the city clubs below, this is the place to enjoy the ultimate Brazilian sunset. A perfect end to your first day in Brazil with children. A brilliant introduction to this exciting city and the perfect way to avoid the traffic, tick off some legendary locations and enjoy some entertaining people watching. Cycle past a kaleidoscope of Brazilian life and watch fiercely contested beach volleyball /football /footvolley matches. Take in the itsy bitsy teeny weeny bikini stands and seafood shacks blaring samba and bossa nova beats. Bronzed elderly couples stroll hand in hand, runners race past in Speedos and workers on their lunch break enjoy the sun. Using safe cycle lanes throughout, this is the perfect way to kick off your trip to Brazil with children. Rio is all about nature and is home to the largest Atlantic rainforest in the world. Spend a brilliant morning climbing up Pedro Bonito peak in Tijuca National Park. Far removed from the crowds you will meander through dense forest in the company of sloth and howler monkeys. Emerge on the smooth rounded rock face (not a safety barrier in sight!) to sweeping views of Rio’s famous coastline and beaches. There are then two options for the descent – either by foot or taking off from the hang-gliding ramp for the flight of a lifetime… a real adventure on any holiday to Brazil with children. Incredibly for such a highly populated metropolis, you can actually go caiman-spotting in Rio’s suburbs. The mangroves of Barra de Tijuca are home to wealthy island houses, simple fishermen’s huts and a wide-ranging birdlife including egrets and cormorants. Hop between the various islands by water taxi and explore the tiny alleyways with their pastel coloured houses where artists and witch doctors reside. Enjoy such mouth-watering local fare in one of the trendy waterside bars. 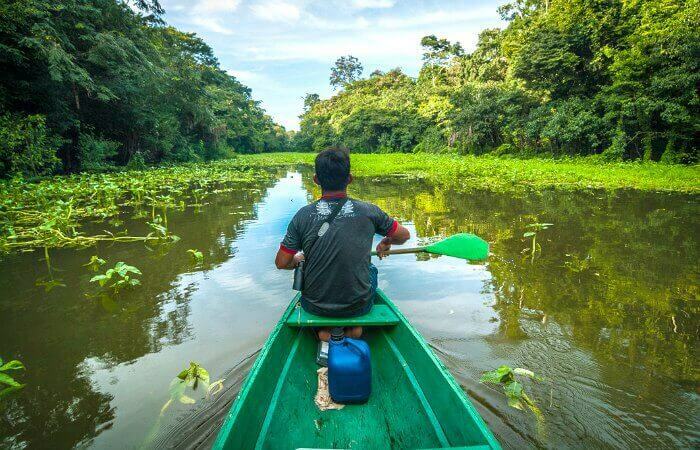 Then take a cruise deeper into the swamps to spot capybaras, giant crabs, howler monkeys and yes, even evil-eyed caiman lurking on the banks. Paraty – Situated on the stunning Emerald Coast, this picture postcard colonial town is well known for its quaint cobbled streets and colourful fishing boats. It has a relaxed, friendly vibe with traditional pousada inns, artisan shops, horse drawn carts and a buzzing night market. Outside the town the incredible variety of outdoor experiences enable families to enjoy the surrounding rainforest, coast and beaches. Only a four hour transfer from Rio or Sao Paolo, Paraty is a must for any trip to Brazil with kids. Waterfalls, wildlife and fun – what child wouldn’t love Paraty?! The order of this tour is somewhat amusing – keep the adults happy with a visit to a caichaca distillery where the kids will get bored and the parents a little tipsy sampling the local liquor. Then take a bumpy 4WD drive (perhaps go easy with the cachaça) to a trail where the children can swim, splash and dive happily amongst a variety of waterfalls. The most exciting is Tarzan Falls where you can ‘toboggan’ down a rockface into a deep pool below. Note to parents – it is obligatory to squeal like a child all the way down. The guide will then show off his skills by ‘surfing’ it standing up – do not try this at home! Take a boat trip up Brazil’s only natural fjord, keeping an eye out for sea turtles beneath you. Here you can climb through dense Atlantic rainforest up Pao de Acucar. After an hour’s puffing up a constant incline, you reach the rocky summit for stupendous 360° views of the emerald fjord and green forest. Back down to the beach for a swim before a fresh fish lunch. Alternatively, forget the hike and take a canoe into the mangroves at the end of the fjord. Here the children can try their hand at catching their own lunch with the local fishermen. A day of easy coastal walks and idyllic deserted beaches. Sound appealing? This is the perfect family day out and a highlight of any visit to Brazil with children – meandering through Atlantic rainforest, massive palm trees and acai plants, clambering over giant roots to emerge into the sunshine onto a long stretch of virtually deserted sandy beach. A few low key bars play muted samba and reggae, hammocks sway and volleyball pitches lie waiting to be used. Head inside now for some really authentic fun in the kitchen. Yes children, trying scary new food can actually be fun, especially when you have cooked it yourself. First learn how to make the perfect caipirinha, Brazil’s most famous cocktail, using its infamous local liquor, caichaca. Yara, the head chef, will take the younger ones off to make coconut milk before everyone dons aprons and gets their hands stuck in. Rustle up intriguing dishes such as black bean pasties stuffed with crabmeat and salsa, fish wrapped in banana leaf served with farafa and fried banana and some mouth-wateringly delicious guava cakes. Throughout, the history of food in Brazil is regaled in an extremely amusing yet informative way that will keep even the most jaded of listeners interested. Staggering back along the cobbled streets (beware of wearing flip flops) after the final course of coffee and aged cachaça rounds off a wonderful evening of local flavour and fun. A guaranteed good night’s sleep in your gorgeous pousada! Cooking lesson in Paraty… and you get to eat it! The Pantanal is southern Brazil’s equivalent of Africa’s Masai Mara. A highlight of any holiday to Brazil with children, the exciting activities include jeep and kayak safaris, piranha fishing, nocturnal boat trips, horse rides and walking safaris hoping to catch that elusive jaguar. Rise early to head out and catch the wildlife at its best in the dawn light. A pair of bright blue macaws swoop overhead and a trio of giant Rheas waddle their way through the endless herds of cattle. A herd of snout-nosed cute capybaras will have the younger ones cooing whilst the older ones will play dare devil and see how close they can come to an evil-eyed caiman wallowing on the banks of the river. Feral pigs scamper into the scrub and a giant anteater lumbers its way comically between the bushes (they also have giant ants here). The birds here will impress even the least interested – pink spoonbills flashing their rosy undergirth, herons, egrets and macaws soar above whilst a Southern Screamer reminds parents of the school playground. A Jesus bird entertains by walking on water and then, with a huge swoosh, a Jabiru Stork flies in with an impressive display from its gigantic wingspan. Heading off on a night safari brings perhaps the most intense feeling of anticipation from any wildlife experience. Torches at the ready, lurch off road into the darkness atop a safari truck. The guide shines the powerful light into the undergrowth hoping to catch the eyes of giant anteaters, cuddly capybaras, lurking caiman and crab-eating fox. The eyes and semi-luminous white flanks of the cattle reflect back, looking like something out of a horror movie. When in the Pantanal you are kept busy on excursions in the early morning and late afternoon, but the middle of the day is spent doing precisely nothing. Too hot for animals, one is forced to laze in a hammock or take a dip in a gloriously fresh swimming pool. Head for lunch in a wonderfully rustic open-air restaurant or enjoy a mean caipirinha (or for the youngsters, a thirst-quenching acai fruit juice) in the bar. Purgatory. Just watch that mockingbirds don’t steal your homemade pineapple cake. A fabulous introduction to the natural attractions of this area. This 10km walk is an easy meander through shaded forest packed with monkeys, birds and the odd snake. A series of nine waterfalls, tumbling over calcified limestone terraces, create a trail full of variety including plenty of swimming opportunities. At the first, follow a rope through a cave to reach the waterfall the other side. Cue lots of squealing (from all ages). Further on a natural beach provides a great bathing spot where the water is exquisitely blue and hugely refreshing after the humidity of the forest. Possibly the most fun you can have snorkelling with giant fish and caiman… Float or snorkel your way downriver (with not a kick of the legs required) on the Olha Aguas River. This translates as ‘Eye Water’ which is apt as the colour of the water is absolutely eye-watering – pure emerald green or bright turquoise depending on the depth. At various times you will be accompanied by tiny fish, great big Durados, crabs and catfish – and even (harmless) caiman. At the end a short walk back through the forest to the cackle of monkeys and macaws takes you to a local farm. Enjoy a delicious homemade Brazilian buffet in a fabulous setting. There is a parakeet feeding station, hammocks, a walking trail through the eco-garden and even a friendly bull to pat. Simply perfect for all ages and abilities. Both of these locations offer superb waterfall fun on a holiday in Brazil with the kids. Estancia Hermosa is a well established, family-run traditional ‘fazenda’ or farm located on a series of waterfalls. A short boat trip midway provides added interest and wildlife of course abounds in the surrounding forest. The slightly newer Cachoeira de Bodequena offers equally wonderful bathing spots beneath waterfalls and on natural rock terraces. It also has the added bonus of a natural pool replete with inflatable kayaks where a guide takes you over a short waterfall for that adrenalin kick. An R&R area with café, volleyball court and hordes of monkeys overhead completes the picture. Near to the Rio da Prata ranch is the largest sinkhole in South America. For once this trip does not involve getting wet – unless you fall into the lake at the bottom of the sinkhole. Not recommended as there are two caiman that live there who did exactly that…. 88 macaws (exactly) reside here and at various time of day swoop, soar and generally flit around in an avante garde display of colour. Only lasting an hour, this is the perfect way to start or end your day in Bonito. Perfect for younger children too as the walk is in the shade of the trees and under a kilometre in length. And who doesn’t love getting up close to a macaw anyway? So you have swum with them and spotted them on the riverbanks. You may have even fished for them. But now it is time to try dining out on caiman and piranha at Bonito’s most lauded restaurant, Casa da Joao. And yes, they taste just like chicken. Piranha broth is a bargain at £3 a bowl. Also highly recommended is the Treida fish dish with of course the ubiquitous farafa (yukka) accompaniment. And the puddings…..well a word of warning, Brazilians have a very sweet tooth and you will find it hard to resist gorging on chocolate anthill cake or endless pastries. The children will love it. The ultimate water experience and a must on any itinerary for Brazil with children. Iguazu means ‘Big water’ and the falls are possibly South America’s most famous attraction. But although popular you will still be swept away (excuse the pun) by how incredible they are. Totally surrounded by rainforest and wildlife, the noise of the jungle will accompany you along the walkways until the noise of the thundering water takes over. On the Argentine side you can peer into the chasm that is the Devil’s Throat, in Brazil you can walk through the spray right beside the falls surrounded by hundreds of exotic butterflies and some rather annoying coati raccoons. And from both sides you can take the ultimate shower and head right into and under the falls themselves. Brazil with kids has never been so much fun. Hint: You are going to get very, VERY wet. This is going to be an absolute highlight of any holiday to Brazil with children. Think white water rafting on a speedboat. Children will love it. Parents might need to discover their inner child. A jet boat takes you through the rapids (and round and round them, then back out and through them again) right to the base of the falls. And then repeatedly drives the boat into the massive shower of water. Again. And again. And again. If you had ever wanted a shower during the day due to the humidity, you are going to get one now. The biggest power shower of your life. And just when you thought it was safe to open your eyes and stop gripping the side of the boat from dear life, the captain switches off the engine as you drift towards a massive whirlpool of a rapid….. (waterproof camera essential, waterproof poncho useless). The Brazilian side of Iguazu is widely recognised as being very natural and spread out so there are less contained pockets of tourist in one place. It is a beautiful walk along the cliffside with constant stunning views of the various cascades (275 in total). There are numerous spots where you can snap that perfect ‘rainbow’ shot and then head out towards Devil’s Throat for a real soaking from the spray (waterproof camera recommended). There is an amazing sense of speed, force, strength of Mother Nature – and just how can those walkways withstand the onslaught of all that water? If you are going to splash (sorry!) the cash anywhere on your holiday to Brazil with the children, this is the place to do it. Not only is the Belmond an exquisite old colonial hotel, with immaculate gardens, billiard room, piano bar and swimming pool, it is also the only place which offers exclusive access to the falls once the park is officially shut between 6pm and 9am. Hop on one of the hotel bikes and ride out through the forest looking for howler monkeys and parakeets, enjoy a caichaca cocktail within sight of the falls at sunset and enjoy a peaceful walk at sunrise with only the raccoons and toucans for company. Magic. Fancy getting up close and personal to a macaw or toucan? Welcome to the Parque das Aves, just outside the entrance to Iguazu National Park. An internationally recognised rescue and conservation centre, the bird park is home to 150 species set in lush rainforest. The backstage experience offers the opportunity to feed such exotic birds in an environmentally and responsible way. The tour may include feeding a flamingo chick or toucan, entering the aviary of native songbirds, getting to know the endangered Atlantic rainforest parrots and interacting with a macaw. This surely has to be the best way of understanding about conservation and wildlife rescue programmes since the last Blue Planet. No list of the best family-friendly activities to do in Brazil with children is complete without venturing deep into the heart of the country (and continent) and exploring the Amazon. Wildlife at its wildest, deep, dark rainforest, fascinating tribes, and falling asleep to the sounds of the jungle completely surrounding you must be high on any family adventure list. The Amazon is shared by many countries but Brazil owns by far the largest chunk. And there are even parts which are non-malarial for families wanting to explore Brazil with children of a younger age. Head out on motorised canoes and let the animal spotting competitiveness begin! By day, the twitches in the trees and the flash of colour in the skies reveal leaping spider monkeys and pairs of macaws. By night you will be amazed how many eyes glint back at your torchlight. Your specialised guide will then teach you the art of piranha fishing so you can try your hand (excuse the pun) at catching supper. Possibly the most unique way to explore the Amazon is by cruising the waters during the day and sleeping on your river cruise boat at night. A brilliant way to get further afield and experience different parts of the jungle in one trip. With opportunities to go ashore and trek through the forest, and visit local villages, this has to be an appealing way to experience the wildlife of Brazil with children. Visit an indigenous family to learn about the medicinal value of the flora and also some of the unique local customs. A truly fascinating insight that the children will not forget. Challenge the local kids to a game of football – there is always space for football in Brazil, even in the jungle! Surely the ultimate Amazon experience. Learn how to find water and use plants for first aid and food. Dine on Cupuacu fruit and Jambu fish tips then fall asleep to the unbelievably loud sounds of the forest, swinging in your hammock (safely off the ground so those creepy crawlies can’t get you). Every child knows the Amazon is home to anacondas, crocodiles, rarely seen human tribes and unbelievable vines and towering trees. They may not know that it is also where the rather cute pink dolphin resides. In some places it is possible to enjoy interaction with these creatures in a responsible way, supporting local conservation efforts. Swimming with these friendly and sociable cetaceans is an incredible experience where it is best to put the camera down and simply enjoy their ‘fly bys’ underwater, seemingly grinning at you in fun. They are loving the encounter and you will too. An unforgettable part of any trip to Brazil with kids. For a compete country overview see our Family Holidays in Brazil section, for weather info see When to go to Brazil and for example itineraries see Highlights of Southern Brazil and Rio, Amazon & Salvador. For (even) more inspiration check out Lonely Planet’s Brazil video and get the kids interested with this great travel guide to Brazil, for kids, by kids. When you are ready to start planning, simply call 01728 751 752 to speak to Helene or any of the Stubborn Mule team – or you can enquire via our contact page. We’d love to hear about your experiences holidaying in Brazil with children, so do send us your reviews and photos. Thank you – info@stubbornmuletravel.com.